You heard us. Despite the world heralding that print is dead, we’ve got news to share: it’s not. Better response rates: In a report, the Direct Marketing Association (DMA) found that direct mail achieves a 4.4% response rate, compared to 0.12% for email. Better brand recognition and recall: 60 percent of those surveyed in the report said printed direct mail left a lasting mental impression on them, making it easier to recall later. Received more positively: 57% of respondents said postcard marketing makes them feel more valued and creates a more authentic relationship. This tells us that when executed thoughtfully and strategically, direct mail is an effective marketing tactic to increase revenue. But, before hashing out costs, it’s important to determine which type of direct mail piece is most effective for your brand. 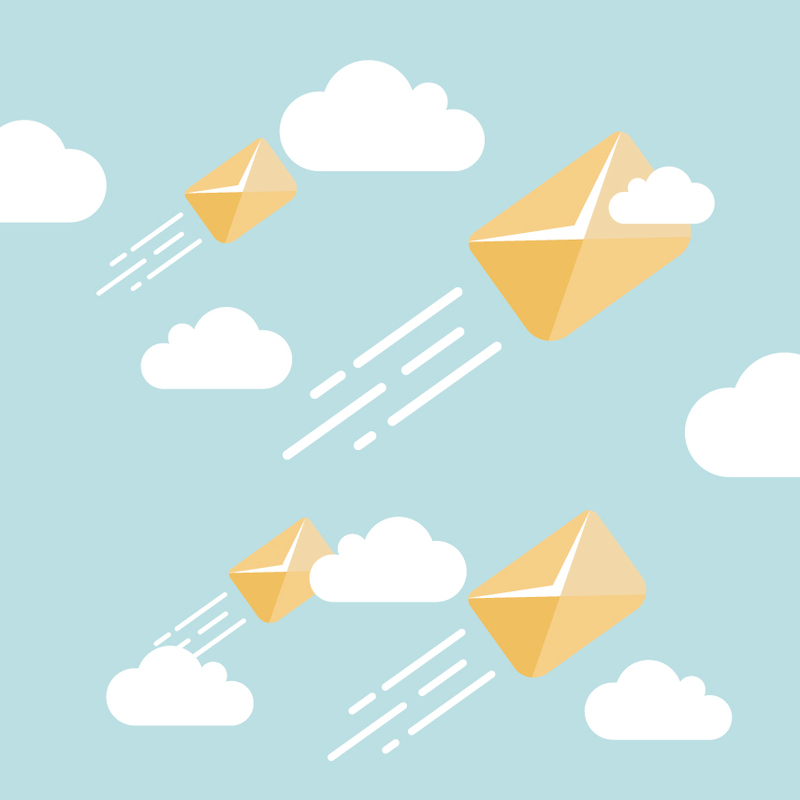 While research from the Data and Marketing Association suggests that the response rate is typically highest for oversized envelopes, you’ll still want to determine what will work be best for your campaign goals. Oversized mailers and catalogs are more expensive to design, print, and ship—especially catalogs because they are far heavier. What are you trying to sell? If it’s more serious, like financial services, you might opt for a traditional letter. If your offer is more easy-going, you can create a playful, colorful postcard. Who are you trying to target? If you’re nurturing current or former clients who know your brand, your message (and its length) may be more concise. A letter or postcard will serve nicely. If you’re targeting cold leads, a more expansive and comprehensive brochure may be a better choice to educate them about what you do. Direct mail pieces can cost anywhere from 30 cents to more than $10 per person, depending on how much you spend on design, copywriting, direct mail lists, printing, and distribution. And still, others opt to work exclusively with vendors as they know it’s outside their wheelhouse and are onboard with opting for the best quality—which leads to the best ROI. DIY: If you need is something basic, you can likely create something suitable yourself perhaps in Microsoft Word. Find or buy a template: You can find numerous online sites that offer free templates or sell them for about $10 a pop. But, these can be frustrating as some sites aren’t intuitive and you are restricted to the designs they offer rather than meet exactly what you need. Hire a pro: If you need help with an important, creative project, we recommend hiring a professional print designer. The price will largely be based on the complexity of the project and number of revisions. For instance, a postcard designed by a novice freelancer could cost as little as $150 whereas a brochure designed by a senior designer at a marketing agency could cost closer to $1,500. If you have a very small budget, you may have no other choice but to write your own marketing copy. If you even a small copywriting budget, we always suggest clients hire a professional copywriter. Maybe your budget allows for a quick proofreading by a pro. Do it, he or she may catch some embarrassing type-o’s or spelling errors. If you have the budget for a writer to take on the whole project, go for it. The copy needs to be compelling and entice the recipient to act—to buy the product or redeem the offer. Proofing of a postcard may be $25 while writing a full brochure may cost upwards of $600. Free mailing lists can be created by either gathering data you already have on your current customers. Purchased lists can be bought from list brokers and agencies, where you will pay anywhere from 2 cents to 30 cents per record. The cost will vary based on how many records you buy, the contact info you require—such as the name of the recipient, his or her title, and additional info like a phone number or email—and sometimes how many times you can send to the list. This is an easy one: Distribution costs range generally from $0.25 to $2.00 per piece depending on how many pieces are being deployed. And, finally, you must consider mailing costs. Prices obviously fluctuate and are dependent on the current postage rate, the amount of mail you send, and how much all of that mail weighs. Generally speaking, the bigger the pieces, the heavier the order, the more you’re going to pay. Just add email! According to the Harvard Business Review’s “Why Email Marketing is King,” it shares how direct mail coupled with email marketing works together to produce an outrageously effective campaign—far more than either one of the individual marketing methods—yielding a 25 percent response rate. Repetition is also critical. As cosmetics and fragrance mogul Elizabeth Arden once said, “Repetition makes reputation and reputation makes customers.” A direct mail campaign isn’t a one-and-done thing. To see results, you should mail out between four and six pieces. According to the National Sales Executive Association, you see a 2 percent response rate on one mailer, 10 percent by the fourth, and a whooping 80 percent by the fifth! Thus, if designed and created correctly, the proper budget is applied, and the campaign is executed strategically and with repetition, a direct mail campaign can be a highly successful way to market your business to your target audience. So get cracking with your marketing team and develop your next creative mailer, or contact your trusted marketing solutions and print management team to learn how best to strategize!